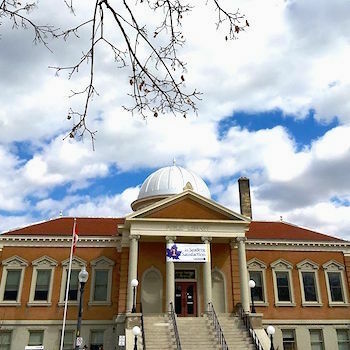 Brantford – Since its launch in 1999 in a renovated Carnegie library building, Wilfrid Laurier University’s Brantford campus has proactively worked to preserve and repurpose existing structures in the community’s core. The university’s track record of adaptive reuse, which saw former banks, a cinema and a grocery store transformed into lecture halls, student study space and state-of-the-art design labs, makes it an ideal setting for the upcoming Our City, Our Spaces tour and talk, presented by Evergreen, a national organization dedicated to making cities flourish. The event takes place on the evening of Tuesday, Jan. 30 in room RCW 202 on the lower level of Laurier’s Research and Academic Centre, West, located at 150 Dalhousie St. in Brantford. Tours begin at 6 p.m., and the panel discussion starts at 7 p.m. This free event is open to the public, and those interested in attending are invited to register online. The panel discussion will feature four community leaders, exploring how Ontario’s mid-sized cities are transforming underutilized public spaces to serve the needs and interests of their communities. The discussion will be followed by an opportunity for questions. Panellists will include: Jay Carter, Hamilton program manager, Evergreen; Avvey Peters, vice president partnerships, Communitech; Andi van Koeverden, director of strategic advancement, The Mount Community Centre; and Antonio Araujo, assistant vice-president: Campus Operations and Risk Management, Wilfrid Laurier University. Acting as moderator will be Sonja Macdonald, principal, Civicplan. For more information or to register, visit Laurier’s website.